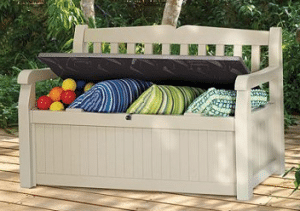 When you are looking for a dual purpose seating for your patio, an Outdoor Bench with storage may be your solution. We will look at five different examples and styles. Weather you need a single seat or dual seat, small or large storage area we will have a selection for you. If you are looking for just storage needs see my previous post on this subject here. 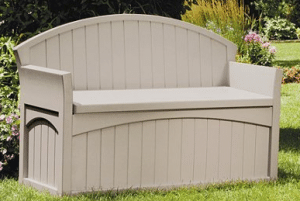 In this post we will look at the size of storage and the styles of the bench, lets begin. This standard looking resin bench has a back, arms and lockable lid. The resin material is weather resistant for use in any outdoor location. Available in beige or dark brown color. It is 23.5 inches deep, 54.5 inches long and 33 inches tall on the outside. Inside dimensions are 50 inches long, 19.5 inches deep and 14.8 inches deep. The lid is 49 inches long by 19.5 inches deep if you want to buy a cushion for it for more comfortable seating. Easy assembly, need to have a screwdriver and about 45 minutes. Instructions state will hold 771 pounds, most customers state that 300 pounds should be the better capacity for seating. This unit offers a lot of storage, seating for two and is lockable. This neutral colored resin bench has a solid design. With a stay dry design to keep all moisture out, your items will remain dry. The arch design will add to many outdoor decors. The bench is 52.75 inches long, 21 inches deep and 34.5 inches tall on the outside. Inside storage dimensions are 48 inches long, 15 inches deep and 19 inches tall. Cushion size will be 46 inches by 17 inches. Seat to ground without cushion is 18.75 inches. Seating capacity is 300 pounds. Assembly is easy with out any tools, it just snaps together. Does not have a provision for a lock. This unit is simple in design, offers a lot of storage, seating for two and easy assembly. This simple two toned design is made with a double walled resin material. The double wall will give your bench more stability and will protect your stored goods with a more solid design. The bench is 53 inches from outside the arms, 24.3 inches deep and 31.6 inches tall. Storage area is 39 inches wide, 10 inches deep and 14 inches tall. Assembly is easy without any additional tools required. Weight limit for the seating is 400 pounds. This unit has a two tone look, double wall construction does reduce inside storage space, does not have provision for locking. This single seat storage solution with a dark brown wicker design, does not have a back or arms. If you need a smaller storage solution or have a smaller space this is your unit. This storage bench measures 22.5 inches wide, 17.5 inches deep and 22.5 inches tall. The storage area is 18.75 inches wide, 13.75 inches deep and 15.25 inches high. Seating area is 18.5 inches wide and 15.25 inches deep. The six parts assemble without any tools in about five minutes. This unit is for your smaller storage and seating needs and will not lock. 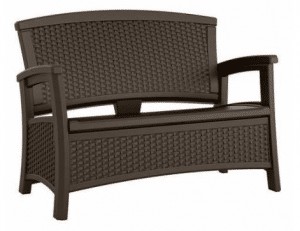 This larger all weather resin wicker like design is more for seating than storage. It has a very attractive design and comes in two colors, white or java. With the open base the storage is limited on this model. The exterior dimensions are 47 inches wide, 29.75 inches deep and 35.5 inches tall. The storage department is 41 inches wide, 18 inches deep, 8 inches high in the front and 6 inches tall in the back. The comfortable seat shape limits the storage space. The seat will require a cushion that is 42 inches long and 19 inches deep. Assembly with require a Phillips screwdriver, rubber mallet and included bolt driver. Does require some skills to assemble. Seat is double walled construction for durability. Seating capacity is 450 pounds. 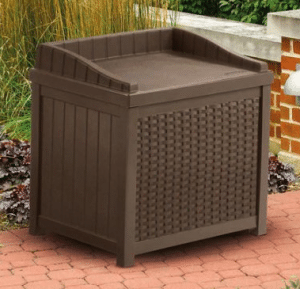 This unit has a great look in two colors for your decor, has a pleasant wicker look, limited storage and does not have a provision for locking. After reading this post you will have a better idea of you needs for your seating and storage solutions. Getting a resin Outdoor Bench with storage is one way to solve this problem in one piece. I have outlined the advantages to each unit and you will have to choose which one will work best for your outdoor space. Thanks for reading my post, if you have any questions, comments or suggestions for my site, use the forms below. These benches look pretty useful and I want to get one which I can use it for my garden. 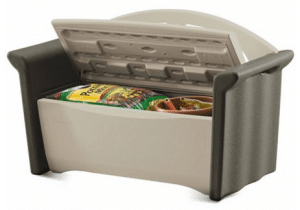 It is pretty useful and I think it might be great to store some of the items in the garden. Storage is a big pain, and this will come really handy. The ability to be a duel purpose item for your outdoor space makes the bench with storage a great addition. Just apply your style and storage needs to find what will work for you. What a great idea – it had never occurred to me before that all that space under a bench or seat could be used for storage – it’s obvious now you have taken the time to write this article and it’s a really good idea. Useful selection you have here as well, you’ve obviously done your research and come up with a good variety that would meet most requirements. As many people have different styles and sizes of outdoor space, Storage and seating may need to be combined to fit. When the colder weather hits and you need to store some of your outside things, this will make more sense. Hi John, fantastic post! I know a lot of people who have these benches, and they’re amazing. They use them when they need extra seating for company, and they’re handy for storing cushions in the off season, and gardening supplies. As a matter of fact, I was just shopping for one yesterday with a friend of mine. She’s downsizing and moving into an apartment with a nice sized balcony. She’s looking for this exact item for seating and storage. Thanks for pointing out to your readers just how useful this piece of outdoor furniture is. Having a storage bench on a balcony will save some space. Small spaces need duel purpose items to make it feel bigger. I like the very first bench, the Keter Eden 70 Gallon Outdoor Bench with storage. I have a swimming pool and have been looking for a storage bench that I can put all the pool toys and chemicals in, as well as having a seat to use. This is perfect! When I click on the picture, it takes me to Wal Mart but I do not see this particular bench. Can I get it at Amazon as well? Yes you can get it at Amazon as well. I did fix the link to go to the correct page. It is the same price. Awesome site! The great thing about resin furniture is that it doesn’t rust! I love the idea of being able to store things in them as well. My mom has a resin cushion holder but it’s not a chair though, I think she would like that one for next to her pond. I really like how you have all of the different storage bench models on your post as it shows the variety that is offered! Great site, keep up the good work! Having items in an outdoor space that have duel purposes helps create the vision of a larger space. The Resin will last a lot longer than most wooden or metal products. Having a cushion for the bench will let you change the decor without getting additional furniture.